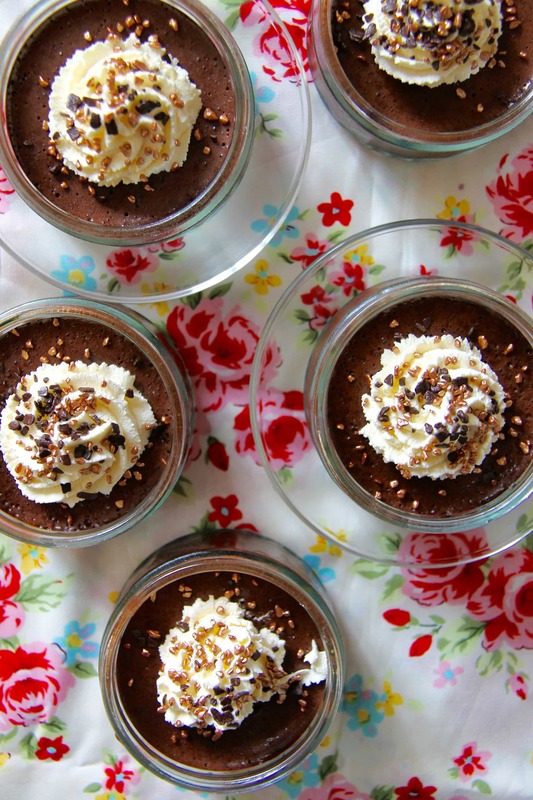 Delicious Gooey, Fudgey, Caramelly & Chocolatey Mousse with a Yummy Light and Fluffy Texture! I have always loved Mars Bars, even deep fried Mars Bars (if you haven’t heard of these, you’re missing out!) and I wanted to make something deliciously yummy with them thats a little different! I have seen a couple of recipes for different Chocolate Mousses and they all look delicious and yummy, but I love the Fudgey goodness of the Mars Bar! These are surprisingly easy to make, and yes they do contain raw egg, but this isn’t a problem! (See my note below) the Chocolate flavour is rich and delicious, but the gooey light texture makes it so worth it – you would think they are too rich by looking at them, but they’re not – so yummy! You guys already know that Chocolate is my weakness, and if you look at the Sweets section on my Recipes page, you will realise that I adore fudge – its just SO good! This is the perfect dessert for anyone like me! 1) Chop up the Mars Bars into small pieces – pour the Cream, Chocolate, Mars Bar pieces, and Cocoa Powder into a heavy-based saucepan and melt on a low heat. Stir the mix gently but constantly whilst it all melts! 2) Once the mix has melted, transfer to a Large Bowl and leave to the side to cool for about 10 minutes, stir occasionally so a skin isn’t formed on the mix! 3) Whisk the Egg Whites into soft peaks (like you would a meringue) I used an electric hand whisk as I was feeling lazy! Once you have reached the soft peaks stage, gradually add the caster sugar a teaspoon at a time (again like you would a meringue) until it is all incorporated into the Egg Whites! 4) Fold 1/4 of the Egg White mixture into the chocolate mix, and then fold in the rest – be gentle as you don’t want to knock out all of the air you made in stage 3! 5) Once incorporated, pour into your ramekins! (I have an abundance of Gü ramekins so I use those, but you can use smaller ones if you’re not a fan of too much rich dessert!) Leave them to set in the fridge for at least 4 hours! 6) Decorate with whipped cream and chocolate decorations and ENJOY! This can sometimes set a little loose if you don’t leave it long enough to set – sometimes if they’re larger mousses they could take overnight to set! Or you can set it as one giant dessert, just leave it overnight so that it has time to firm up! You can use more Mars Bars in the mix to make it up to 200g, but I nearly always bulk it out with the Milk Chocolate as sometimes Mars Bars can be so expensive!! These will last 2 days in the fridge! Older Next post: White Chocolate and Cranberry Cookies! Newer Previous post: Chocolate Fudge Cake with the BEST Chocolate Frosting ever! Would these mars bar mousses freeze ok do you think? I’m afraid I’m unsure as it has raw egg in! Sorry!! I do not know what these are! A candy bar? I wish there was a photo so I could see… But your mousse looks perfect! And I’ll update and will tag you when I make this! Did you like how my caramels came out? Thanks! And yes I did, they looked amazing! Do you reckon these would work with other chocolate bars like Milky Way?